I love watching the warmup almost more than the competitions, at least as far as the actual tests. This was one of the standouts, not only because he was gorgeous but because he was a little naughty. I always wondered how horses stay sane after a week on a show-grounds with no turnout. This guy seemed to be feeling exhuberant. Another thing about the warmup -- no helmets, except for the juniors who are required to wear them. One woman had sort of an elaborate hairstyle, very attractive long blond hair in a sort of bouffant style that framed her face and then went down her back in a pony tail. I could not resist looking her up and would you believe she was a successful junior rider who was sidelined for several years after a riding accident? Yet still no helmet. Oh, I agree about the helmets. 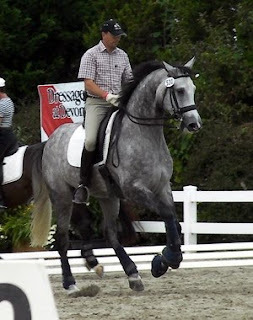 For some reason, dressage riders seem to think they are immune to horse riding accidents. I've even had to argue with my trainer about putting on a safety helmet before riding my horse. And in the schooling ring, more than any other place, why take the risk? Horses locked in a stall all day on an active showgrounds are not likely to be the quiet darlings they may be at home. The gray is gorgeous. Looks to have some "bounce" in that canter. Bet he has a hefty price tag if he has international potential. I love that horse, he is gorgeous. Wonder what the price tag is on him. Unbelievable that there were so many riders without helmets. Accidents do happen, even at a walk. I guess for some people looking good is better than being safe to ride another day. Gorgeous horse. Don't like how they are riding him, though. Very against hyperflexation. Just my opinion. Nobody slam me! How I wish the upper level riders would be better examples (re: helmets)! Urggh, no helmets make me so angry! I have said that if I ever get to such a high level, I will wear my helmet no matter what! There is no reason to risk something as valuable as your brain for the sake of fashion and tradition. Accidents are always possible, no matter where you are or what discipline you ride. Just this evening, I saw 10 year old children being led around on a boarder's horse without helmets! There is no excuse for putting a child on a horse without a helmet, even if you are leading the horse. Grr. Sorry about the minor vent! According to the ad, they are looking to get $250,000 USD for him. Wow! I agree with Billie about Willano--gorgeous horse, wish he wasn't so overbent. I too, don't get the lack of helmets. It drives the barn DQs crazy, but I ALWAYS ride in a skull cap. Since it seems to be the theme of the day (although yes, that horse is looooovely! ), helmets, let's talk...I am recovering from a head injury I sustained a month ago WITH a top notch expensive helmet on. I was walking my extremely quiet, non spooky horse after a 45 minute ride and he got startled and bolted. My cranium broke my fall, not fun. If I hadnt had a helmet on, I am positive I'd be in the hospital still. I did have one on though and I am still foggy, having severe headaches, etc. I cant stand people who take the chance and go out without a helmet, even if it is 'just dressage' or 'just a hack' or 'just cooling out'...trust me, you cant deal with sweaty helmet head...dealing with lingering brain issues is not so easy though! I like the warm-up arena, too. Often you can get much closer to the competitors, listen to comments and advice, and watch the "big guys" deal with the same issues we amateurs experience. As to helmets, we used to warm up on the flat without them and then don our helmets for jumping -- until our trainer received a bad concussion. She stuck to horses like glue and was schooling a greenie on the flat when the incident occurred. Shook us up -- if she could get hurt badly, we ammies definitely weren't immune. After that, we always wore our helmets. And when a Pony Club chapter started up at the barn, we adults wore our helmets as good examples in addition to the sensible safety factor. I now ride dressage and never climb into the saddle without my helmet.